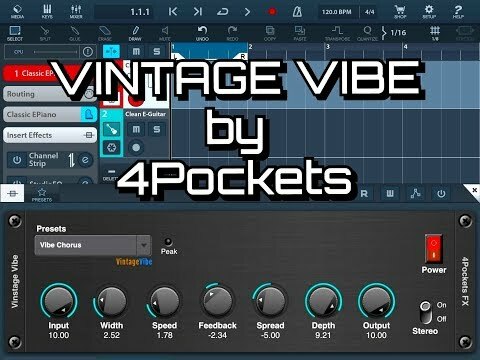 Vintage Vibe is based on the classic Uni-Vibe effect, it creates some very cool “Leslie Speaker’ style effects, sounds great on guitars or keyboards. This one flew under the radar for me until about 2 weeks ago. It's the only Univibe-style app I've come across and it does the job nicely. The thing about the Univibe is that's it's not quite a Leslie imitation and it's not quite a phaser or flanger. It's sort of a combo of both and definitely it's own thing, and Vintage Vibe is a nice recreation of this very specific effect. I'm fascinated by software recreations of guitar pedals. Came across something similar with Blamsoft's DC-9 Overdrive, based on the classic Ibanez TS-9 Tube Screamer. Fun to have a software version to muck with. Anyway, I dig this one - it definitely needs more attention.